President Felipe Calderón announced three changes in his cabinet tonight, including the appointment of his fourth Secretary of Government. Head of the Office of the President: Patricia Flores Elizondo, sometimes called Mexico’s unofficial vice president, was ousted. Viewed as fiercely polemical and partisan, she has attracted her share of enemies, both within and without the Government. She recent(ly became vulnerable because of the disclosure that her four sisters and mother were on the government payroll. (Although there are rumors that she will be made an ambassador, the President made no announcement.) 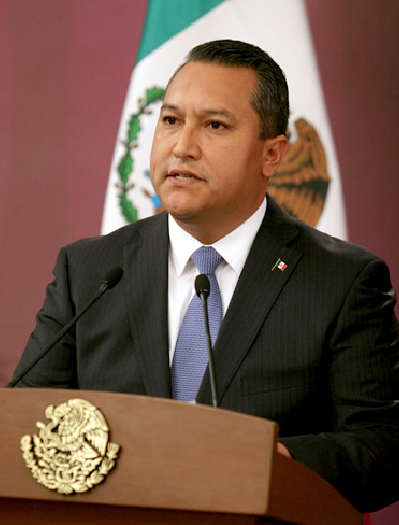 She is being replaced by Gerardo Ruiz Mateos, Secretary of Economy, who previously held the same job and has been one of Calderón’s closest advisers during the campaign and over the first three years of his Government. Secretary of Economy: Bruno Ferrari, the head of ProMéxico, the government’s foreign investment promotion arm, takes over from Ruiz Mateos. Ferrari was previously a senior executive with Seminis Vegetable Seeds and Grupo Pulsar. In Mexico, press coverage of insecurity doesn’t persist simply because of editorial decisions, but also because of the specific weight that it occupies in the Government’s strategies. The results of this war have deteriorated the image of the country, even to the point of suggesting the existence of a failed state. It is certainly not the case that the media are responsible for fomenting more violence or for keeping insecurity as a priority in the national agenda…. Fighting crime and enforcing the law is not a subject just for the media, nor for the parties, nor the responsibility of just one government. It is an obligation of the State, of the entire Mexican State. Many countries which have confronted the problem of organized crime … have agreed that, in the final analysis, the matter of communicating security operations and the matter of constructing the perception of violence have affected the levels of violence. So, just as Colombia made its well-known agreement for discretion, and the media in Spain agreed on how they would communicate terrorist acts and the anti-terrorist policy of the Spanish State, this is a reflection of what where we want to get to. We believe that violence will decrease in the coming months. The acceleration of violence is slowing down. We will see smaller numbers by the end of this year. The link to the Brookings event is here.